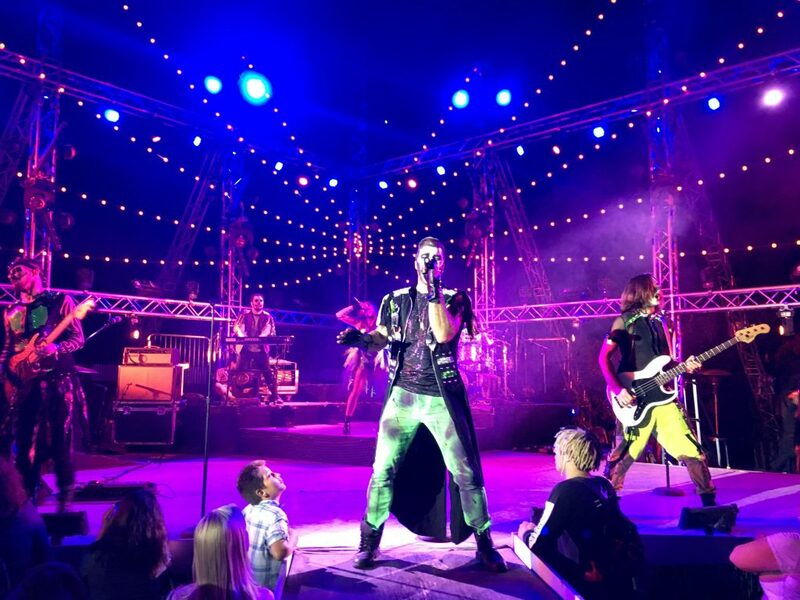 Immediately entering the park Voodoo Nights takes over the Full Throttle Plaza with such excitement. 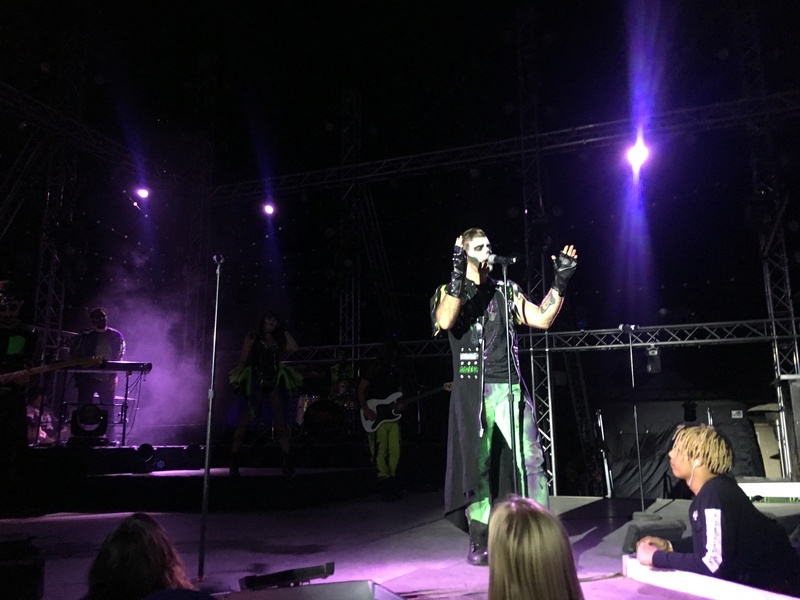 The show it self comprised of classic rock, metal, and top 40s music all performed by the Voodoo performers seen below. It was great to see all types of music genres showcased on the stage. The high level energy from the band made the show that much more engaging to watch. This is the only show during Fright Fest that will run continuously each night starting at 7 pm. The trance like performances continued in the Golden Bear Theatre. The High Sierra Hypnotist returns to put a spell on many lucky mortals in the audience. This by far was one of the most comical shows I have ever seen. It is perfect because it allows random audience members to become a part of the cast. Suzy Hayner, who has also made appearances on shows such as Inside Edition, is a world renowned hypnotist that comedically vamps your experience each time. 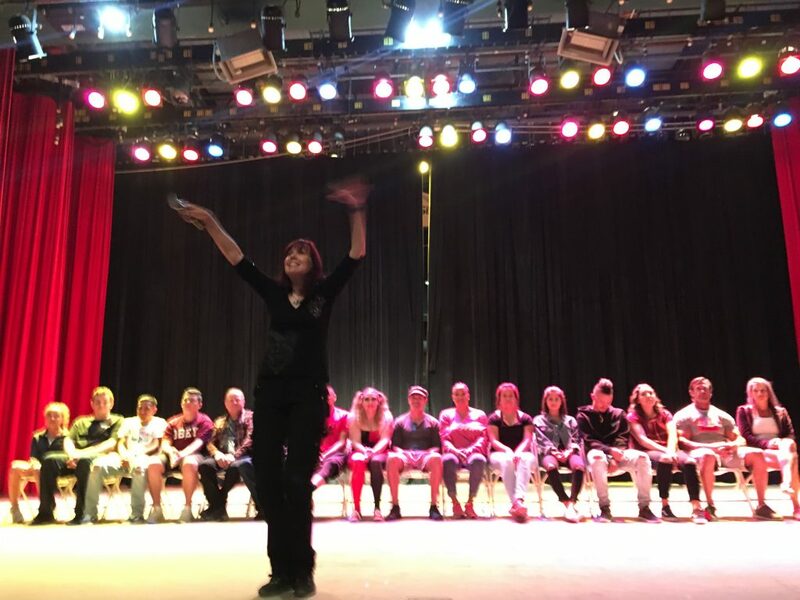 Be sure to check out the High Sierra Hypnotist Saturday’s only during Fright Fest at the Golden Bear Theatre. 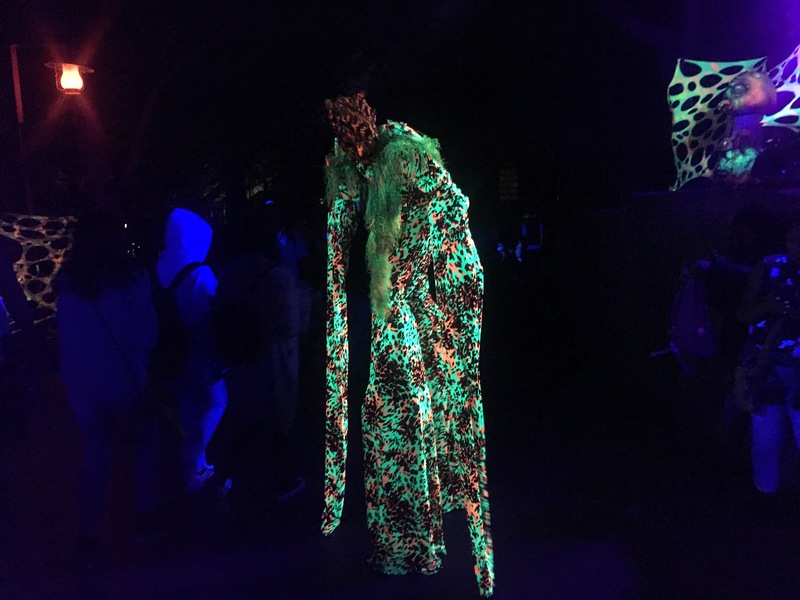 The “monstertainment” continues through many of the scare zones in the park. 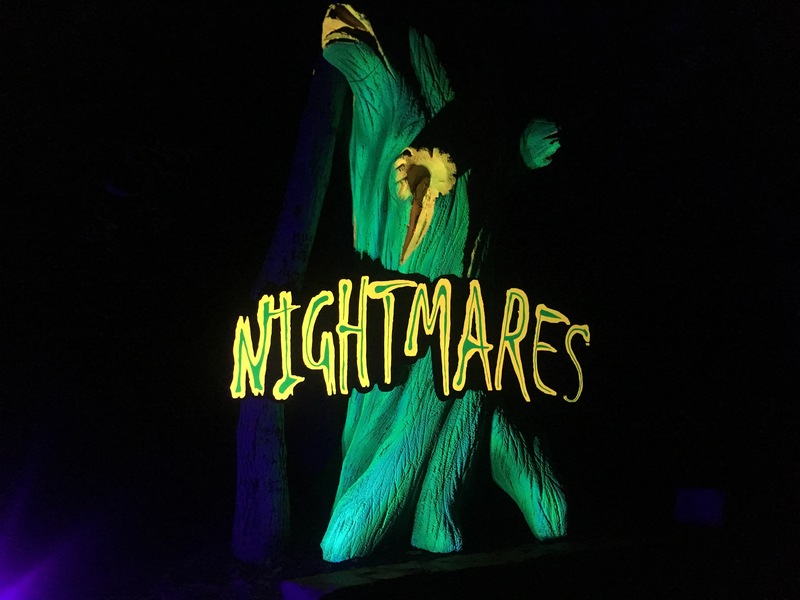 It was great to experience Nightmares: A Twisted Fantasy because it was aesthetically pleasing and the sets wonderfully optimize the use of black lights! This is not the only presence that the night summons to tell its tale. The actors were beautifully terrorizing and passed through this area with grace. 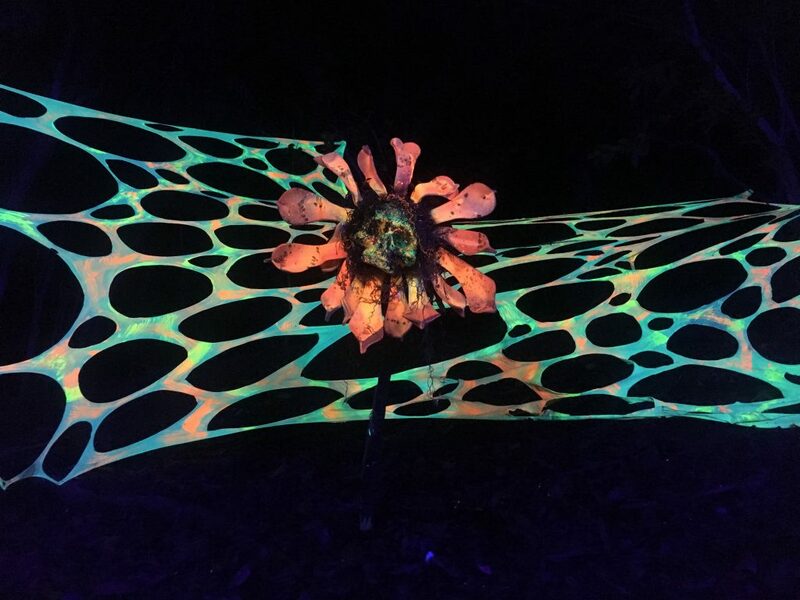 The webs were well crafted and inviting at the same time.The flowers and surrounding vegetation could be seen with skulls that seemed to each have a personality of their own. 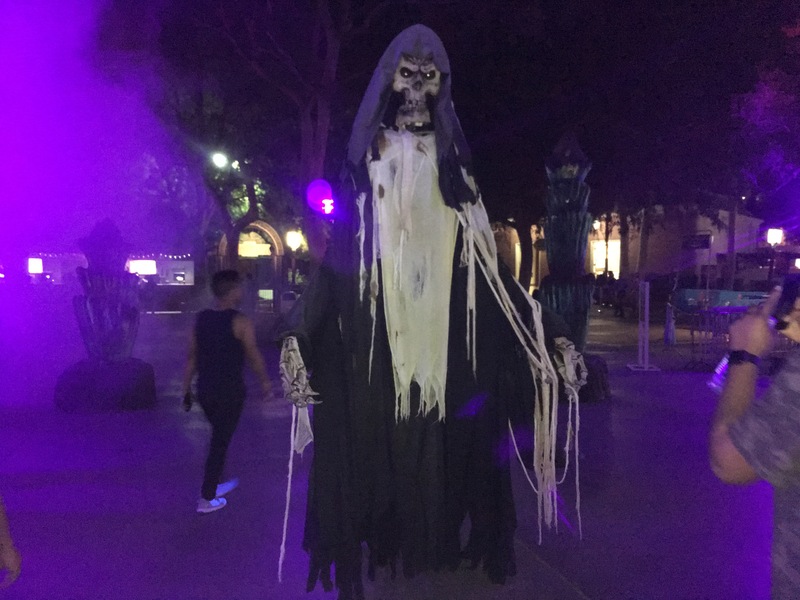 The are certainly much improved over the years and really is one of the park’s better scare zones. 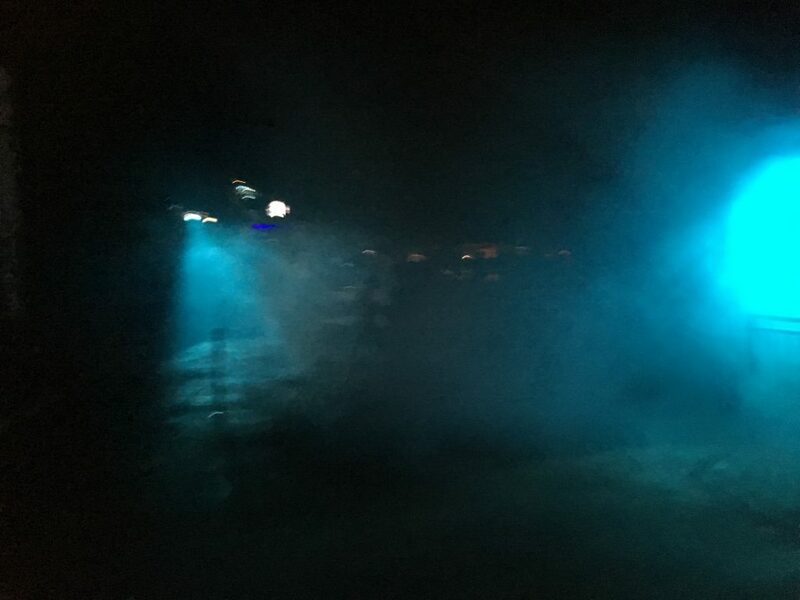 Fright Fest uses many sound and lighting effect but the fog effects made it feel as though we walked on a lonely path through the woods. Scary! This image was taken on Exile Hill (Samurai Summit) and the fog would completely cover you. This was the zone of the dead and they marked their territory accordingly. 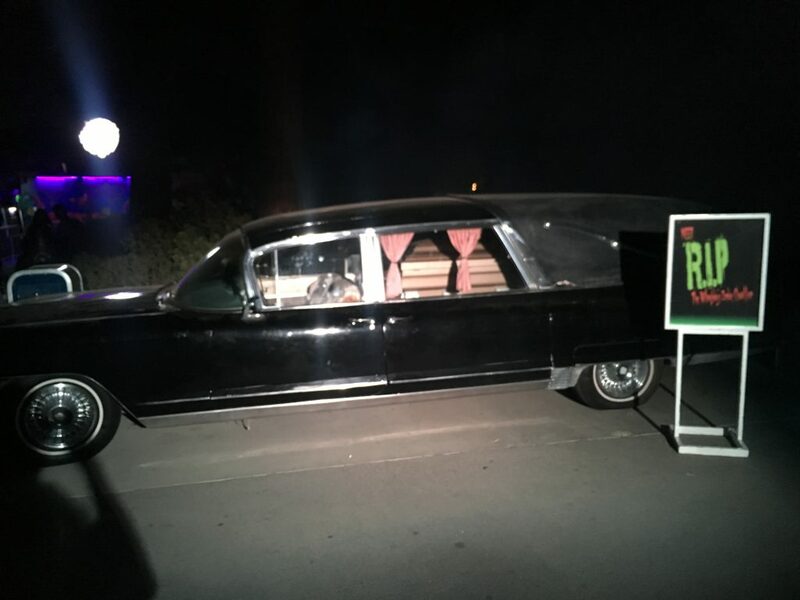 The hearse is parked perfectly. Need a ride? Down in Metropolis, there were new inhabitants to the park. 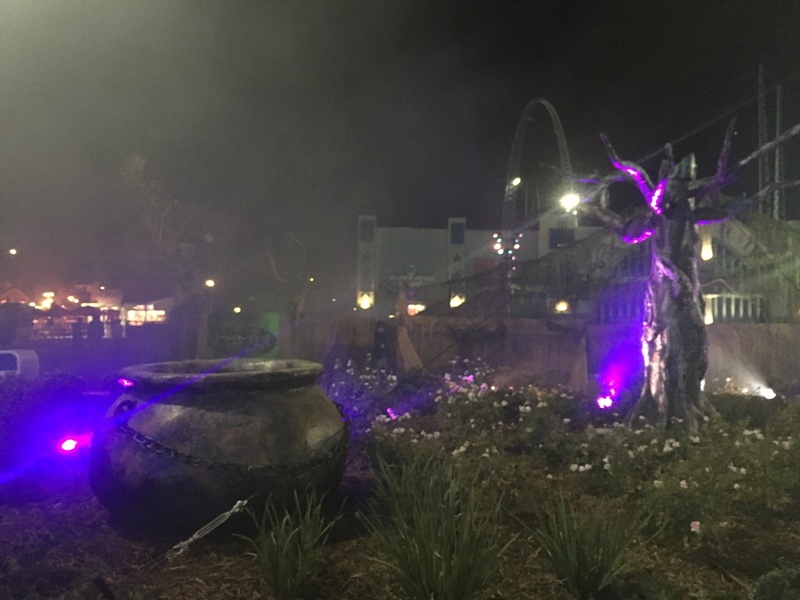 The Witch’s Lair is a new scare zone that allows guest to walk freely through many swamp like structures with hidden surprises. Beware of the many “witches” that love casting spells. Not to far from the Witches Lair, many comic like character have taken over the newest metropolitan area. 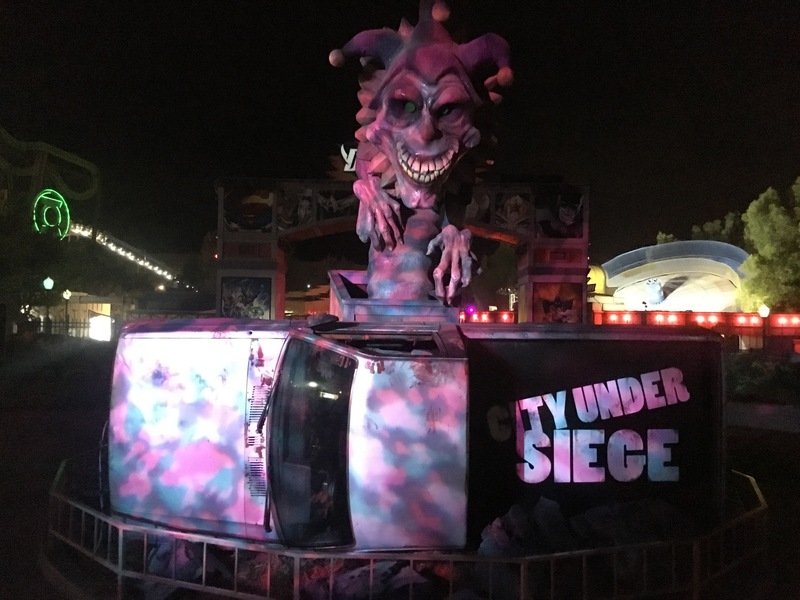 City Under Siege returns to the event this year and combines the art of comics with the design of a twisted horror movie. 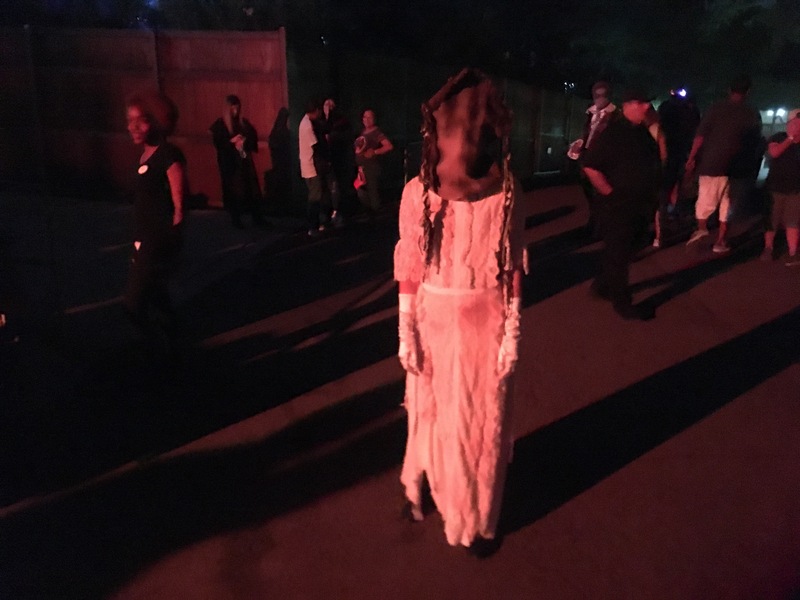 Terrortory Twisted is the largest scare zone in the park. The sound effects and lighting truly brings everything to life as it allows for your mind to wonder to a different Screampunk era. 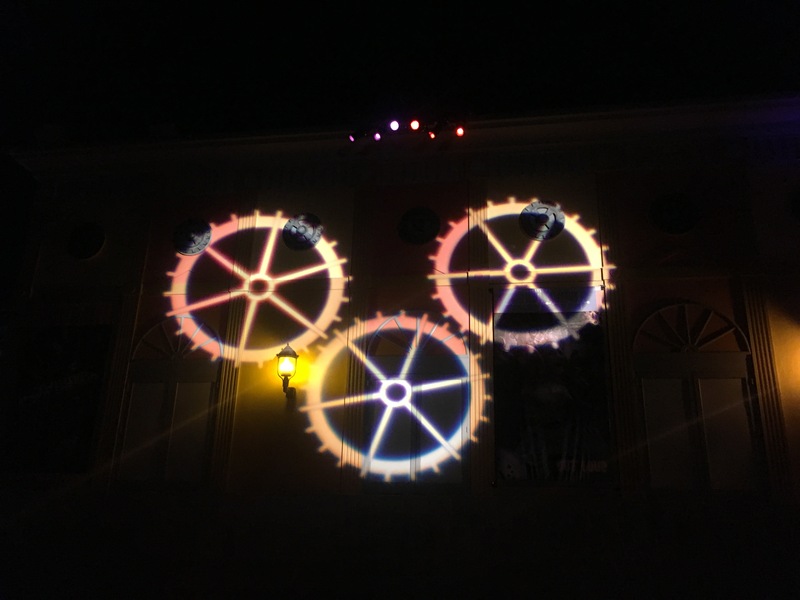 The Gearworks Theatre had amazing projections of gears. The grinding and mechanical sounds that radiate throughout this zone increase the level of terror. 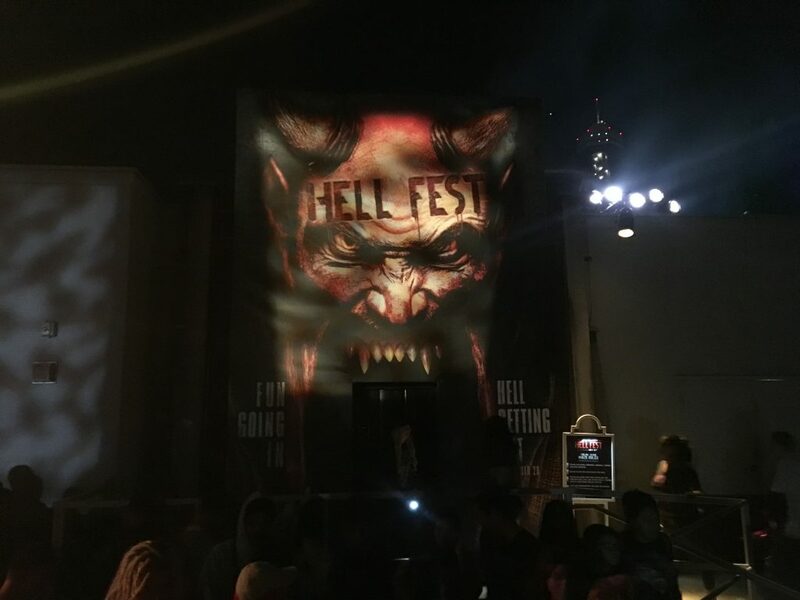 Fast forward to the present, the Demon’s Door scare zone lures guest into the gateway of hell. This zone is great because it is immediately after entering the front gate of the park and can not be avoided. Great way to start your evening at the event, and to end it! This is one of the oldest territories returning to the park. It includes lighting, fog, black light effects, and scare actors. Unlike previous years, there were a tremendous amount of actors all throughout the zone. It felt like we were merely guest in their realm. The end of the zone is literally the pit of Hell. 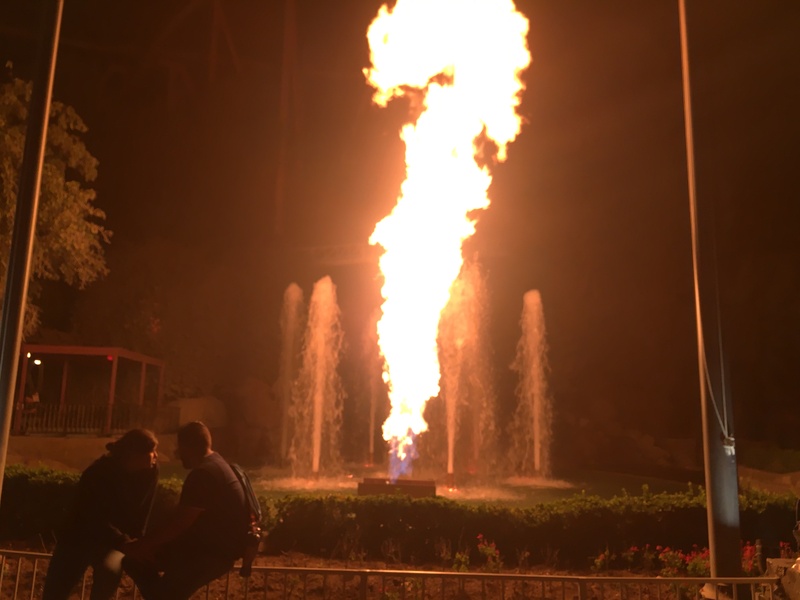 This flame thrower gave quite the scare to guests as they passed by because of it random fury and immense heat. 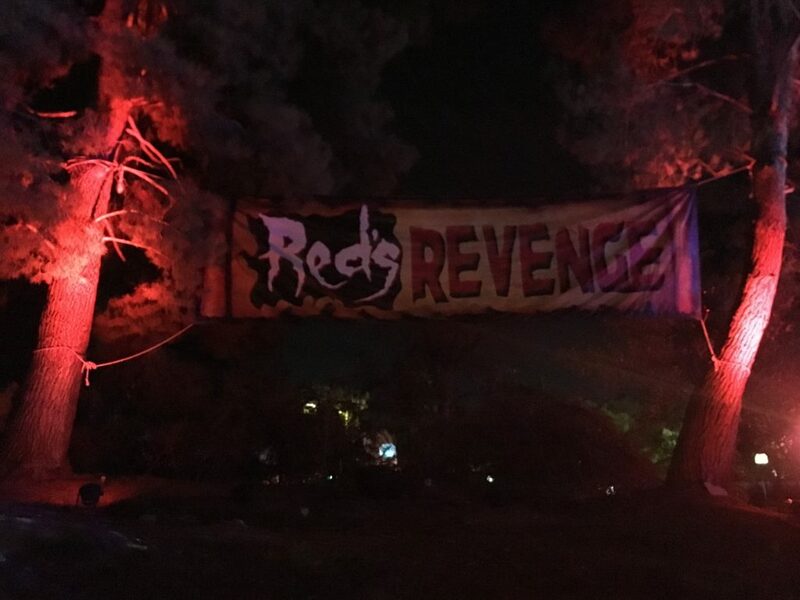 The landscape at Six Flags Magic Mountain makes this event so much more terrifying. This year there were three new mazes added, for a total of six overall. 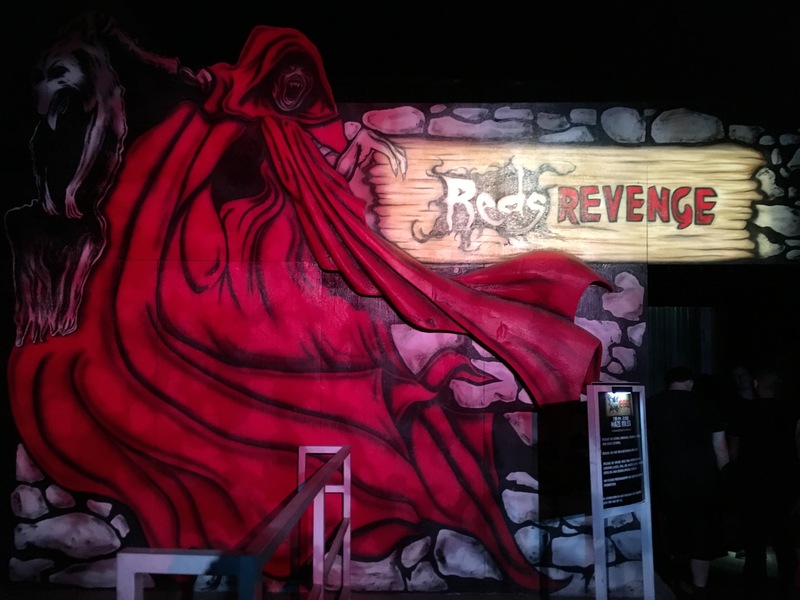 Red’s Revenge is a fan favorite that returns to put a horrifying twist on a classic tale. Back for more revenge, this maze shows little red riding hood possessed by the heartache. This maze is different from the other five as it features a pre-show just before entering the sets. This will prove to be one demonic tale that is not worth missing as even Red herself makes an appearance. In an alternate reality, Aftermath 2: Chaos Rising proves to show just how deadly a virus can be to common civilians. This is the largest outdoor maze in the park and is more of a show than an actual walk through maze. The actors as a whole did a great job moving us through the entire area which made it feel as though the experience would never end. Lets move inside to Willoughby’s victorian mansion. 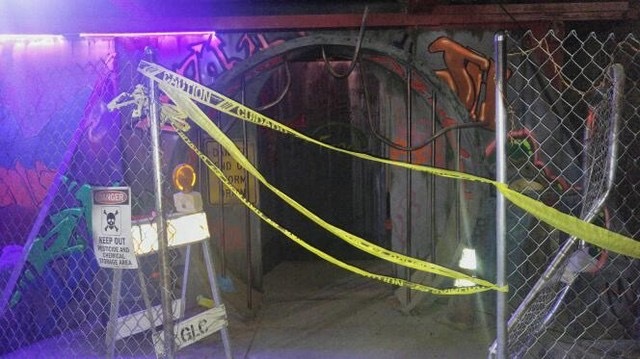 This by far has always been my favorite maze at Fright Fest because it brings the classic haunted houses to a psychotic and un-nerving level. Willoughby’s Resurrected invites guests on a tour through the entire estate which includes the dining room, bedroom, kitchen, and even grave yard. There were unique virtual paintings that would follow you through each scene that were very creepy. 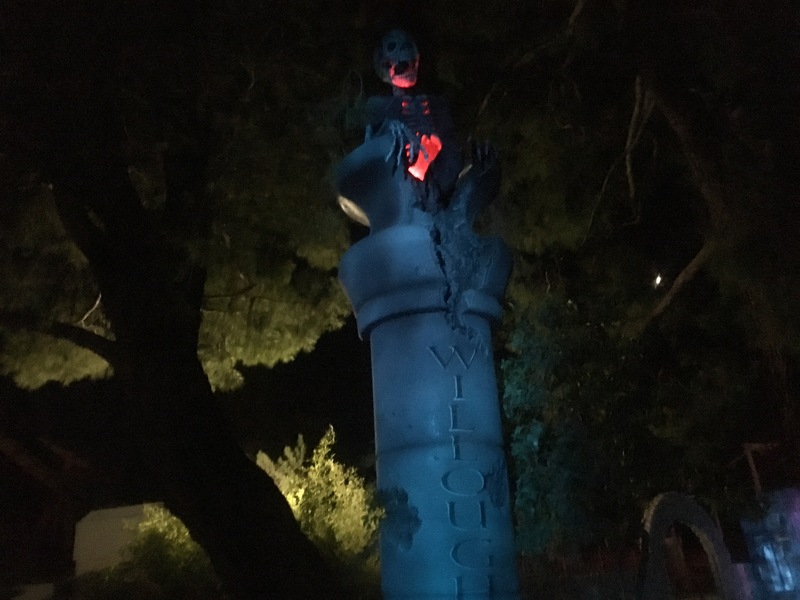 We would definitely suggest making it a priority to visit the Willoughby’s on your trip to Fright Fest. New this year, Sewer of Souls also resides on Exile Hill. 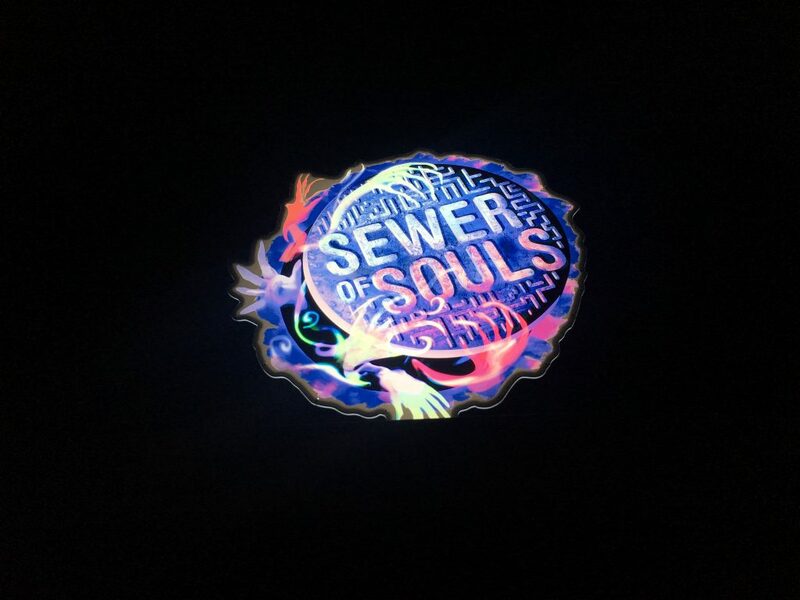 The Sewer of Souls tells the tale of souls lost in a sewer system. The ideology of death and disease play perfectly here. As previously reported in our Six Flags Magic Mountain park updates, guest will enter through the left side of the building entrance. 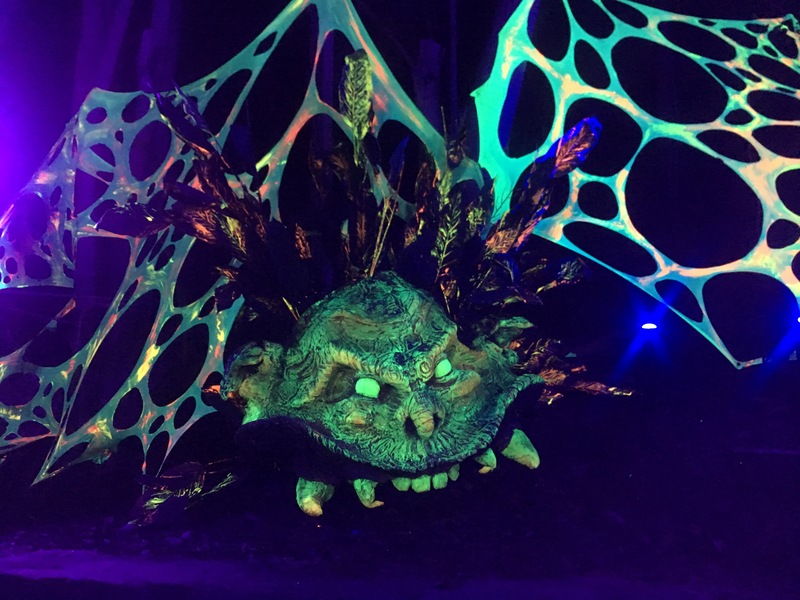 Similar to the previous maze Toyz of Terror from last years event, the set features 3D effects that guest will see using 3D glasses throughout the entire maze. I am particularly fond of the scene that leaves guest 50 ft above a rushing river of souls. 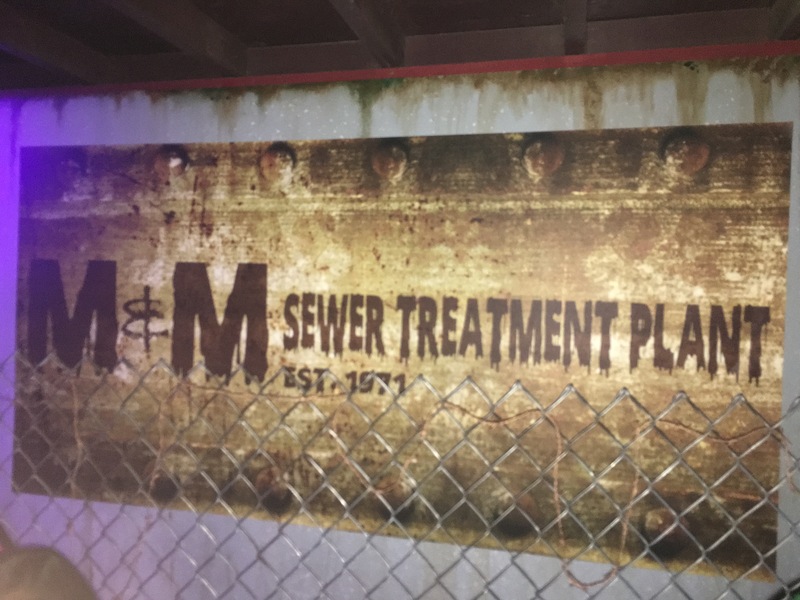 We had a special treat from management that allowed media to enter directly into the sewer itself to begin the maze. This section served as a break space for employees with complete practical effects . The tunnels were so disgustingly great. 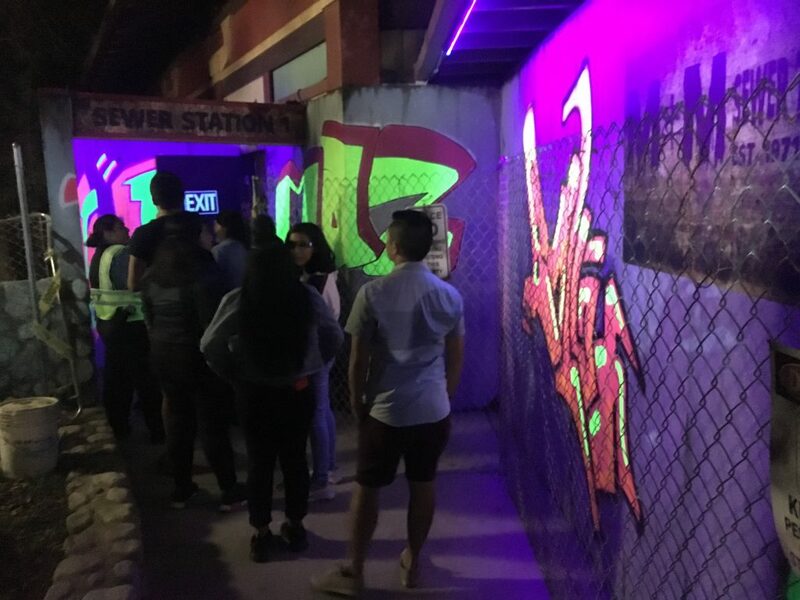 The set design proves to be a winner among the crowds that offers unique sounds that combine the grinding of a sewage facility with vibrating floor effects. 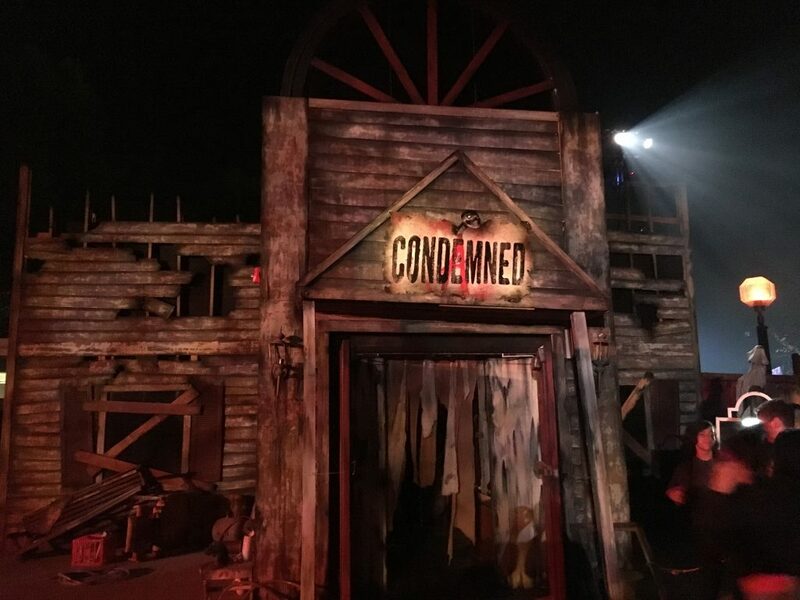 Another Fright Fest original this year brings a dilapidated house of souls who once lived here to be Condemned: Forever Damned. The eerie-ness of the building is perfect and allows for guest to transcend into its walls. The dead were in many nooks and crannies of the house, sometimes even crawling out of the cabinets under the sink. 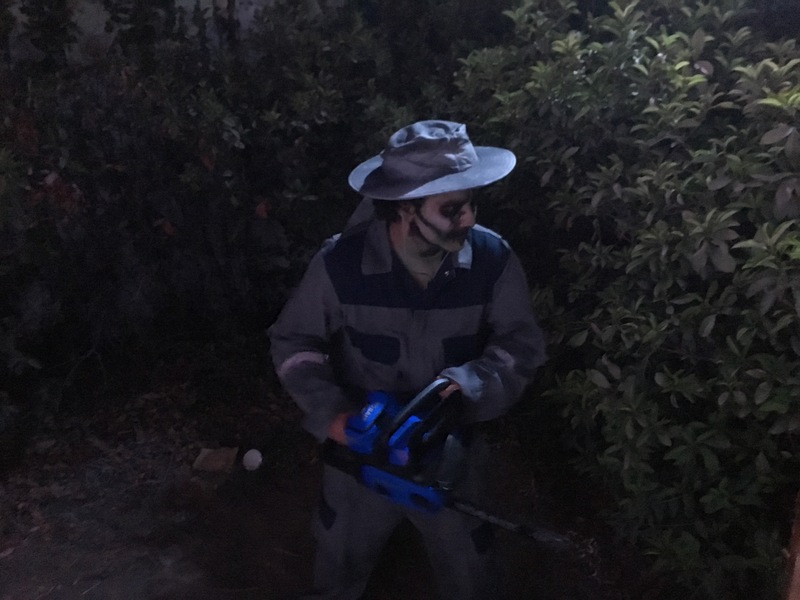 This was one of the best layouts of any maze I have experienced. 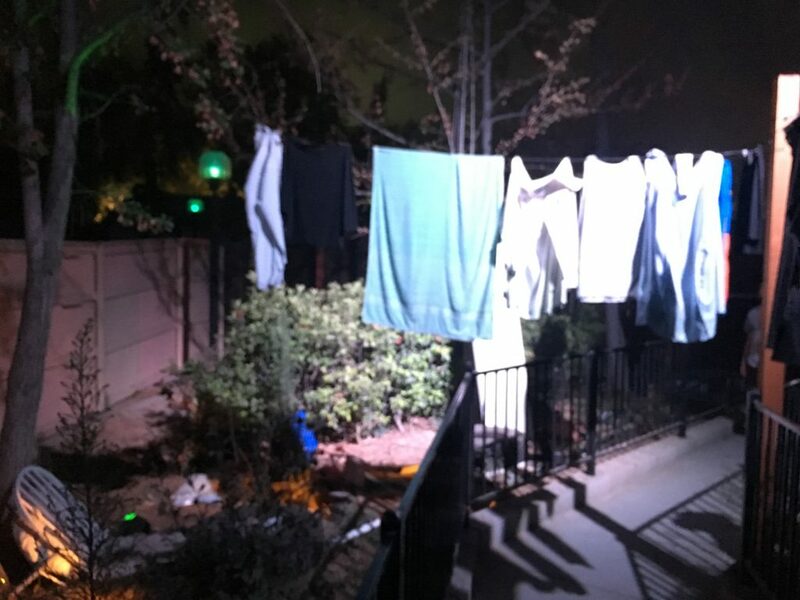 The scares do not end with the maze, the linen of the dead are hanging to dry in their backyard. Be careful, some of them have also been condemned to the soil they died on. 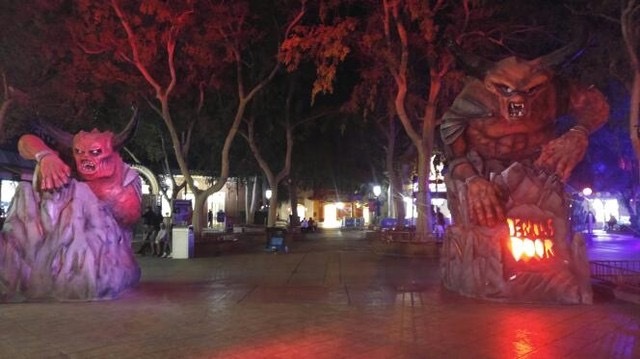 Lastly, this is the first time Six Flags Magic Mountain has premiered a maze themed to a movie franchise. 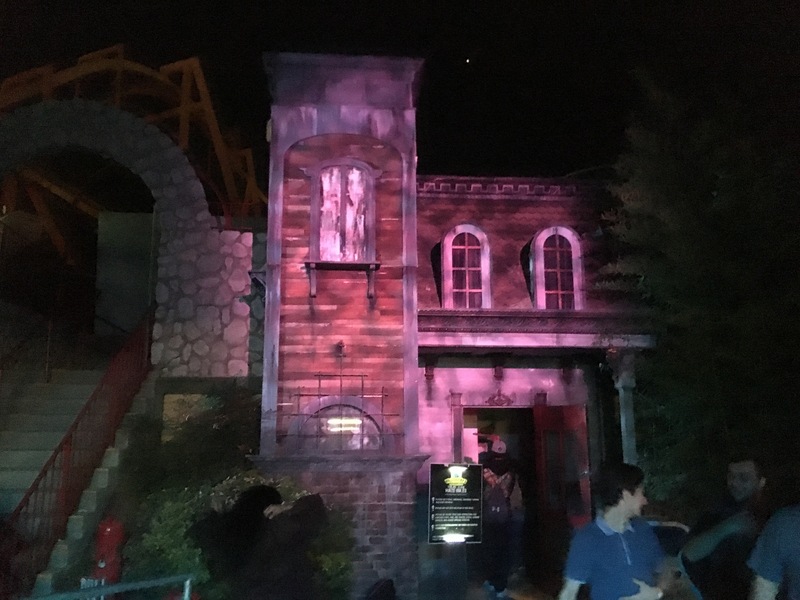 The maze itself showcases unique designs as it is entirely inside a building which made the scenes seem more adrenaline pumped as though you were watching your favorite horror film. Not only does the maze effectively capture the film’s essence, it features a choose-your-path style that is reminiscent of scenes in the movie. 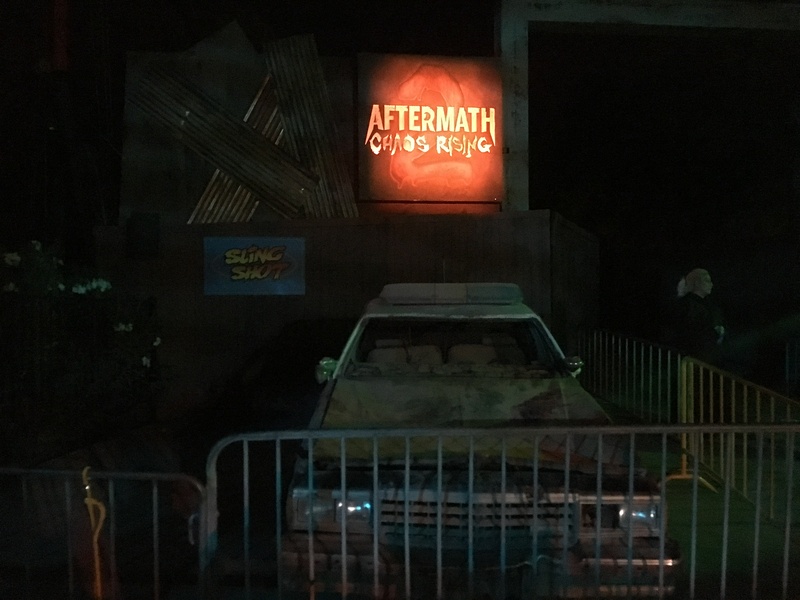 The stage outside showcased many characters from the movie near the entrance of the maze. It was perfect as guest could see some of the actors beforehand which set the mood for the maze. 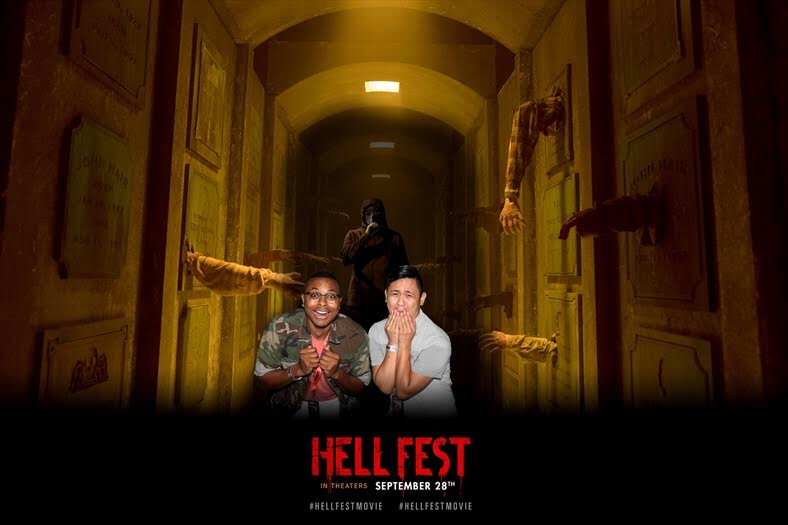 There was a green-screen photo op across from the entrance of the Hell Fest maze that allowed guest to walk away with some digital photos for added fun. I love taking photos and I think they came out devilishly! 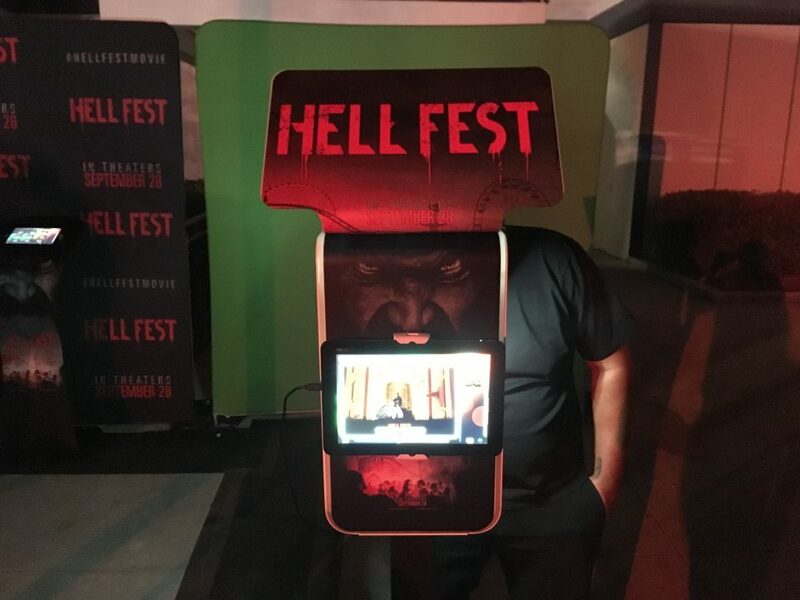 Be sure to check out Hell Fest in theatres 9.28.18. 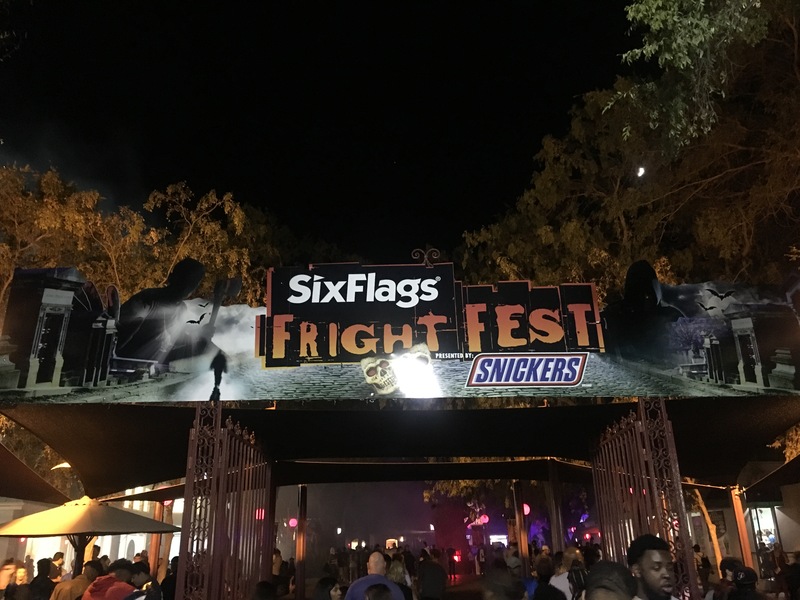 Six Flags Magic Mountain did an amazing job this year for Fright Fest. 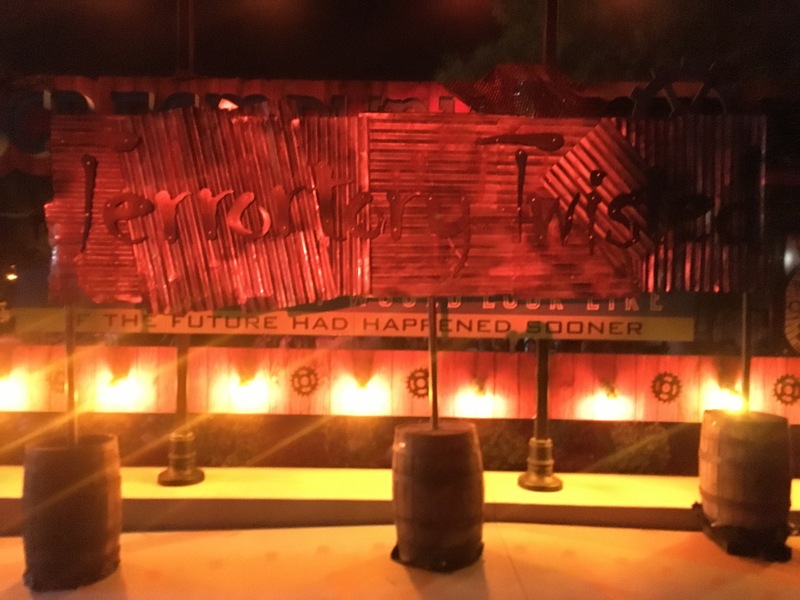 It was great because all the attractions were very engaging and unique. We would like to thank the management team for inviting us out and as always thank you all for reading. Check out Some of our recent updates! 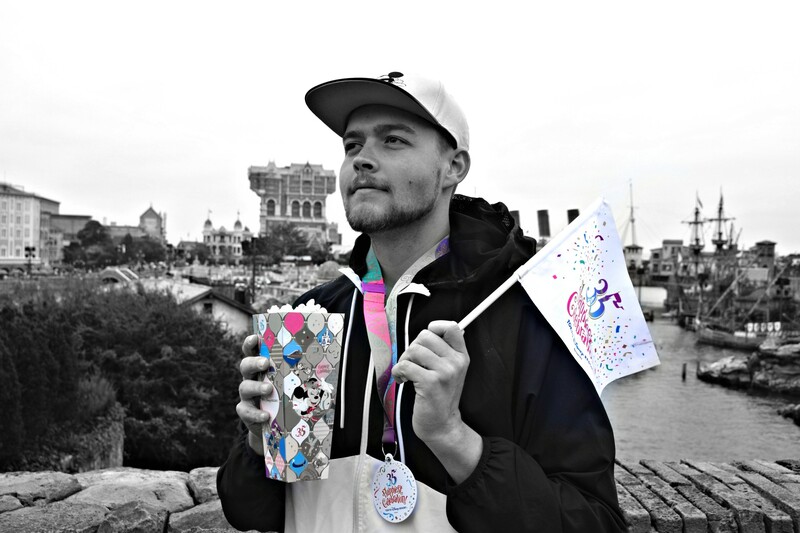 Previous PostPrevious Walt Disney World in ONE DAY!